So finally we are in Sacramento. As I mentioned, I have a scheduled plan to continue from here and all the way home, I just haven’t worked out all the fine details of plan. I figured that there would be problems and some adjusting would have to be necessary, especially when dealing with trying to fly on Space A. Naturally I’ll be chalking this up to more learned experiences because from beginning to end, my plans were not even close to what actually happened. 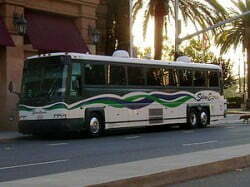 So in Sacramento I am expecting to find a shuttle service called Stan’s Shuttle. It is run by a retired military man and he can bring you directly onto the base. I believe the price for this service was to be either $65 or $70, but I wasn’t sure if it was per person or per trip. Either way it didn’t matter because the people at the Sacramento bus depot never heard of this shuttle service. Oh great, more complications. The information I received was either insufficient or I interpreted it wrong. The base is not even close to here. So know it’s time for Plan B. Problem is, I didn’t have a Plan B, so I had to develop one. I think it’s always better to make alternate plans after you get a full scope of the entire situation. We have never been to Sacramento before and didn’t know a thing about anything there. So Plan B was derived after taking into account all the resources that were at my disposal. 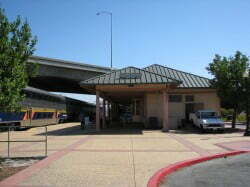 Plan B turned out to be to take the Amtrak to the actual small town, Fairfield-Suisun, that the base was next to. Greyhound went there, but their next bus was the next day and besides, we are pretty tired of riding buses by now. Sacramento is the closest “large” city to the base and that is important I guess if you are flying in, but taking a bus is a different thing all together. 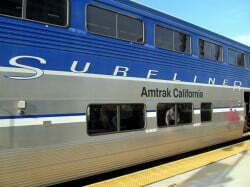 So I called the Amtrak station and found out the next train leaving to Fairfield- Suisun leaves in 5 minutes. According to the taxi driver, it takes 5 minutes to get to the train station, so off we went. It did take only about 5 minutes, but the fare turned out to be $10. We paid him, grabbed our bags and ran inside. They just closed sales on the tickets were wanted about 30 seconds before we got there. Oh well, that goes along with what’s been happening to us on this eventful journey. The next train was leaving in 1 hour and 45 minutes. I bought our tickets, $16 each, and we waited in the nice lobby they have there. 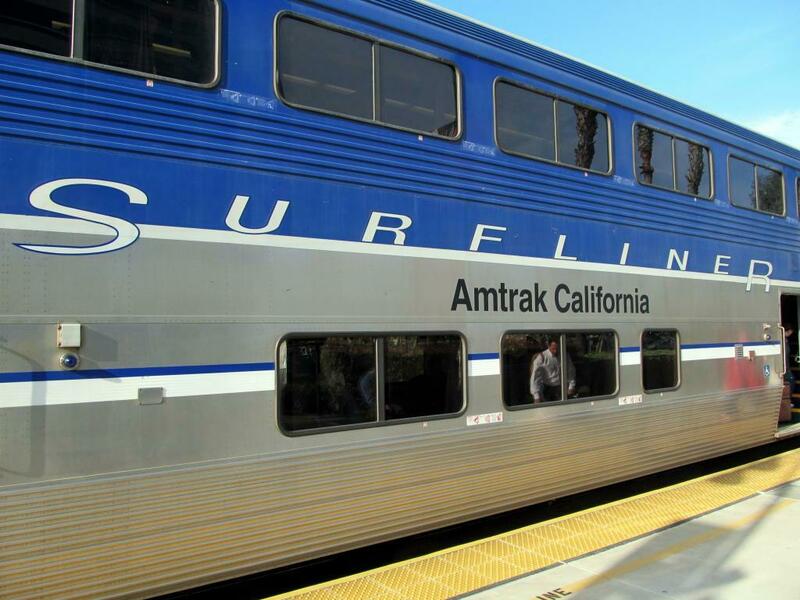 While we were waiting I decided to find out how much it costs for a train ticket from Temple Texas to Sacramento California. As it turns out, it wasn’t as expensive as I thought, but still more than the bus fare. They told me $194 per person, one way. That is $388 versus the $340.50 for the Greyhound. To not have to put up with everything that we did and to also have better scenery, we decided that it would have been worth the extra $37.50 to us and will go via Amtrak versus a Greyhound whenever a choice has to be made between the two. Within the 4 connections via Amtrak, we would have 2 bus trips though, totaling almost 3 hours of travel time. I also noticed for almost double that $388, we could get a small sleeper compartment on the train for the longer portions of the trip. Total time of the Amtrak trip I found was 48 hours and 27 minutes. I’ll have more on something I learned about Amtrak in a future post. It will be worth taking note of for your train travels. So on the train we go to the 2nd level to sit down. It actually looked like the only place to sit anyway to me. I had to drag 3 of our 4 pieces of luggage up those narrow stairs. Lita got the light one. They were nice seats though and there were only a few people on the train. Our stop is the 2nd stop, so we sat down and relaxed. The first stop came rather quickly, but we had to wait almost a 1/2 hour after that for our stop. I must say that the scenery along the way was better than what we saw on the bus. 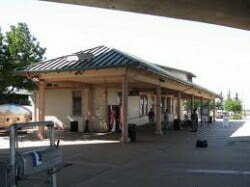 Lita and I were the only ones that got off the train at Fairfield-Suisun. I went in to ask about the shuttle service that I figured must be here because I saw their ad on the internet and it said they picked up from the airport, Amtrak and Greyhound. But of course the only young lady behind the counter never heard of them either. So I guess it’s time for another yet to be developed Plan B. The city bus was our answer this time. For 2 $1.50 fares (exact change required) and a free transfer, we were on our way again. We got on bus #8. They have very nice city buses and there was only 1 other passenger on there, a little midget guy that was nice enough to help with our luggage. The bus driver was also nice and after I told him what we wanted to do, he said he would be sure we got off at the right place. As we pulled up to our stop, the next bus was already there. This next bus went straight to Travis AFB and dropped us off right at the passenger terminal. Finally we made it there. As I was dragging our luggage into the terminal, I saw one of those shuttle vans that I had been looking for, letting others out to go into the terminal and getting ready to pick up others. Now, after the fact, I’m glad that I couldn’t find that shuttle. Remember I told you that the shuttle fare was $65-$70, maybe per person, and our entire trip from the Greyhound station in Sacramento to Travis AFB only cost us $45 total. That was $10 for the taxi to Amtrak, $32 for the Amtrak tickets and $3 for the bus tickets. If that shuttle would have been in Sacramento, then I would not have learned of this less expensive and not too difficult or time consuming way of getting there. Now I’ve passed that information on to everyone that is reading this section of the post. Okay so now we are at the passenger terminal and I have made sure that they know we are there. There is not a flight to Osan on the schedule, but you just never know. There are a lot of people here and our priority is very low. It could end up being a long stay here, maybe as much as 2 weeks, depending on the flights, the number of seats, the number of passengers and the priority of those passengers. We were prepared for the long haul. Interesting Knowledge: On February 22, 1989, Barbara Jo Rubin became the first female jockey to win a horse race. She rode Cohesian to victory at Charlestown Racetrack in West Virginia. The first woman to ride in the Kentucky Derby was Diane Crump on May 2, 1970. Helios Airways Flight 522 crashes north of Athens, killing the 121 on board. Sales tax holiday in Massachusetts. All sales taxes are suspended on purchases of $2500 or less. Ilich Ramírez Sánchez, the terrorist known as “Carlos the Jackal”, is captured. Lech Wa? ?sa leads strikes at Gda?sk, Poland shipyards. The Senegalese political party PAI-Rénovation is legally recognized. PAI-Rénovation thus becomes the third legal party in the country. Loggers cause a forest fire in the Coast Range of Oregon, later known as the first forest fire of the Tillamook Burn. It is extinguished on September 5, after destroying 240,000 acres (970 km&sup2;). The first claimed powered flight, by Gustave Whitehead in his Number 21. A joint European-Japanese-United States force occupies Beijing, in campaign to end the Boxer Rebellion in China. Japan’s first patent is issued to the inventor of a rust-proof paint. The Cape &#65279;Girardeau meteorite, a 2.3 kg chondrite-type meteorite strikes near the town of Cape Girardeau in Cape Girardeau County, Missouri. Irish under Hugh O’Neill, Earl of Tyrone, destroy English force at the Battle of the Yellow Ford. 1383-1385 Crisis: Castilians are defeated by Portuguese at the Battle of Aljubarrota.